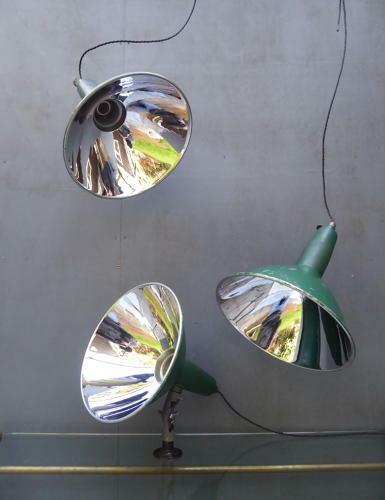 A small run of scarce vintage industrial mirrored wall lights by Benjamin. A fantastic trio of Benjamin wall lights in their original painted finish with highly polished mirrored reflectors & articulated cast iron wall brackets. Super lights which do not turn up very often! Wired with a generous length twisted black flex. Three available, priced per light. Wear commensurate with age, very good condition, mirrors in outstanding condition, exteriors clean but unrestored with expected wear & loss to the paint. The lights come rewired & ready for installation though as they are often mains wired, they do not come with plugs or switches. They can be fitted with plugs & switches at cost, please enquire for details. UK courier service available at £13 for a single light or £16 for two or more, tracked & signed for 24 hour delivery.